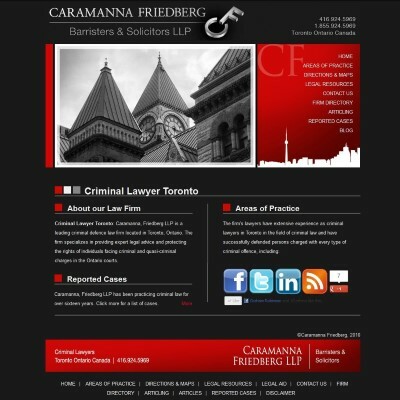 Caramanna, Friedberg LLP is a leading criminal defence law firm located in Toronto, Ontario. The firm specializes in providing expert legal advice and protecting the rights of individuals facing criminal and quasi-criminal charges in the Ontario courts. In 2008 we started looking for a website design firm to take over our search engine optimization campaign. We were not listed in the first 100 results for our phrase Criminal Lawyer Toronto. After a few months of working with Northern Computer Services we were #1 in Google for multiple phrases. We highly recommend Northern Computer Services to manage your website design and your SEO campaign. When contacting Northern Computer Services we will respond to you within 48 hours. If this is an urgent matter please use one of the phone numbers below.